The 88th Academy Awards ceremony is coming up tomorrow, Sunday February 28th. The Oscars is one of our favorite events of the year and one of the best parts is watching the gorgeous looks on the red carpet. That got us thinking. If we could attend and brush elbows with celebrities on the red carpet what would our dream outfits be. Check them out below and share your ideas in the comments. 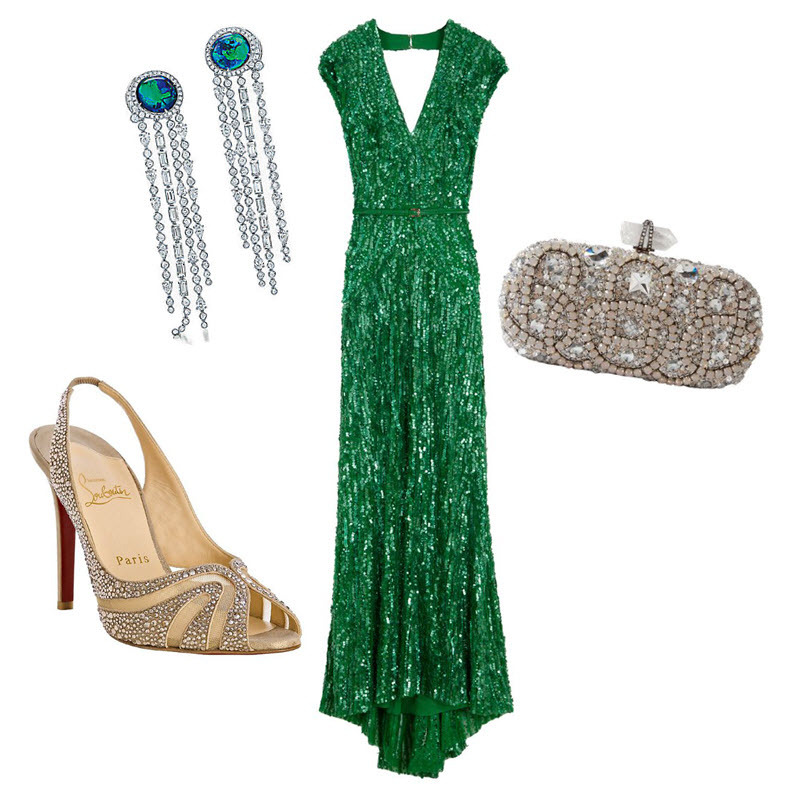 My dream red carpet ensemble would be heavily inspired by one of my favorite decades: the 1930s. The dress itself would be a hand-sewn, bias-cut, silk charmeuse, floor-length gown. Asymmetrical neckline. A-line skirt with a clutch of draping. Set-in waist. A rich teal color. The shoes would be Italian-made leather, metallic gold d’Orsay pumps with leather soles. The handbag would be a vintage Whiting and Davis gold mesh evening bag. The jewelry would be vintage Tiffany & Co. An Art Deco bangle and long, drop earrings both in yellow gold and diamonds. And, finally, the piece de resistance… The entire ensemble would be topped off by a white mink caplet. If I was lucky enough to be walking the red carpet I think I would want to wear my favorite emerald green, such as used in this gorgeous beaded cap sleeve gown by Elie Saab. 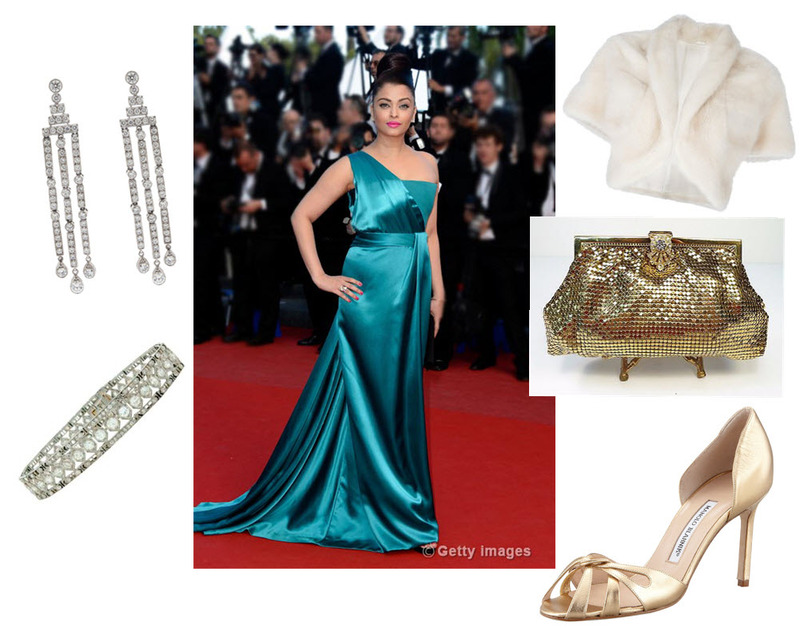 For accessories I’ve paired it with Christian Louboutin crystal peep toe slingbacks, an opal and Swarovski crystal embroidered clutch by Marchesa, and black opal and diamond earrings from Tiffanys. What would your dream ensemble be? For a little inspiration check out this fun infographic by mediarundigital.co.uk of all the best actress winner’s dresses from 1929 through 2014.